To see the league discussion forum click here and then "Go to League HQ"
To see MLB injury reports click here. Check MLB scores here. 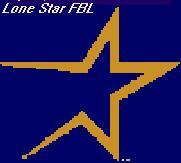 Welcome to the web site for the Lone Star Fantasy Baseball League. In this, our 3rd season, we are moving further into the technological age. This year's co-commissioners are Tim Ludwig and Doug Waring. We welcome two new teams this season, the Barley Malts and the Goof Balls. 8/28: Ken Hill, Tony Gywnn come off DL! In one of the most hotly contested races in league history, the Dahlonega Disastros edged out Mystery Hill II and the Blue Ridge Chiliheads to claim the first half prize. The Disastros rallied from a 200-point deficit in week 11 behind the white-hot bats of Sammy Sosa, Alex Rodriguez, and Ken Griffey Jr.
Excelerators take the early lead. See current standings for more details. The Maris HR record is toast. BOTH McGwire and Sosa will break it.